Condo # 312, is a courtyard view condo. Our beautiful condo is located in the heart of vacationland. Orchard Beach has been welcoming tourists and families to its beautiful 7-mile stretch of perfect sand beach for over 170 years. Families love all of the family-friendly activities and amusement parks including the veritable beachfront Palace Playland Park. Two parking spots are included in each rental, one spot on site and one in an off site lot that is a short walk from the Grand Victorian. Start your day with a workout in the fitness center, a refreshing dip in the indoor pool, a walk on the beach, or a relaxing swim in the ocean. Spend the day at the beach boogie boarding, building sandcastles, surf fishing, or buried in a good book. Later in the day, visit the famous Old Orchard Beach Pier which is the center of the recreational offerings, extending nearly 500 feet over the Atlantic Ocean. The Pier features fresh seafood, famous fries, pizza, fried dough, caramel corn, and old-fashioned novelties and amusements. In the evening, restaurants and nightlife abound. Venture directly across the square and try your luck at the arcade, and marvel at the spectacular sights from the top of the Ferris wheel. It is all right outside your door. If you prefer to explore outside of Old Orchard there are fabulous shopping at the nearby Maine Mall, or in Kittery and Freeport. There are also some of the most popular food destinations in the country, such as James Beard award winning restaurant Eventide Oyster Co. right in Portland, only 45 minutes away. After nearly 50 years, train service has resumed to Maine. In 2002 the train resumed its seasonal scheduled stop in Old Orchard Beach. Trains are now traveling eight times daily between Boston to Portland. Old Orchard Beach is a seasonal stop that will be open from May through October. For more information on “Downeaster” rail service to Old Orchard Beach contact Amtrak. *Views from decks may vary depending on weather conditions, time of year and where the unit is located in the building. We have nine units that offer a variety of views from courtyard to the ocean. please see GRANDVICTORIANWATERFRONT. COM. for more information on your unit of interest. Summer rates for a two bedroom unit start at $2,800 per week + 9% tax and a $200.00 linen/cleaning fee. Summer rates for 3 bedroom condos start at $3,800 + 9% tax and a $200.00 linen/cleaning fee. 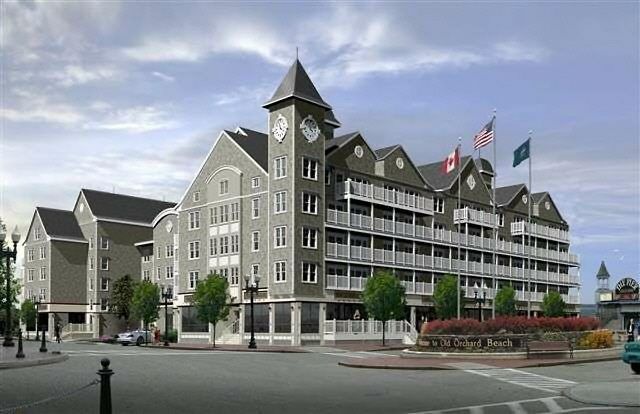 The Grand Victorian is located on the Beach right in the Heart of Downtown OOB next to the Historical Pier and Palace Playland Amusement Park! there are 2 Elevators in the building. Two parking spots are included in each rental, one spot on site and one in an off site lot that is a few blocks from the Grand Victorian. Each condo has dining table which seats 4 plus large gathering island in kitchen which seats an additional 4. Great condo with easy to deal with owner. The condo was clean and well maintained and in the heart of everything OOB. Thank you Tim and Melissa. The unit was nice and clean, had ample space and all the major necessities for our family to stay for a week. Unfortunately, the location was horrible - we will not be going back. The area was extremely loud every night. The hallways, elevator and immediate area surrounding the property was dirty and smelled. The train blew it's horn loudly waking us at 5:35 every morning and continued into the night and the street sweeper made a few trips every morning as well making it hard to ever sleep in. The pool was beyond small. The proximity to the beach was the main highlight, but having no view, only that of the dirty, smelly street below, meant no time enjoying the outside space on the balcony. Absolutely perfect...location and accommodations made us feel right at home! Our condo was beautiful and had everything you needed to feel right at home! Very spacious and the location was perfect! We will be making this a summer tradition for our family! Melissa was so sweet and helpful and accommodated us with our late arrival! It was a great first visit to Maine and Old Orchard Beach was awesome and relaxing! This condo had all the conveniences you could think of! It was clean with all new appliances, silveware, dinnerware and glassware, even wine glasses! The washer and dryer in the condo was super convenient. The beds and furniture were extremely comfortable and new. The personnel kept everything running smoothly and clean...even the hallways were constantly vacuumed. I will be coming back next year to the same place! LOVED IT!!!! The condo was impeccable! Clean, modern and just so so comfortable! The owner, Tim Swenson greeted us when we arrived and was very very nice. I am planning on returning there next year and advising all of my family and friends to only rent Tim's condos because they are exquisite! We have 9 units for rent that are located at the Grand Victorian The building is located on the ocean in Old Orchard Beach, Maine. It is centrally located and the Portland and Kennebunk areas are only 15-20 minutes away. Old Orchard Beach has something for everyone and the Grand Victorian is steps away from the beach, amusements and a multitude of restaurant and shops. It is 5 minutes off the Saco/Old Orchard exit off of I-95.